An electric fireplace TV stand is a multifunctional piece of TV & media furniture that allows you to heat your room in style. It does not need any fuel and only requires electricity. You get all the pros of a fireplace – heat and comfort, without any cons. You do not need to clean any ashe, chop wood, or get your hands dirty with coal. Heat is generated with an electric heating element. The heat generated by a fireplace space heater spreads in the room evenly, unlike traditional fireplaces. The worry about starting a fire on accident is a thing of the past with electric fireplaces. They can be placed in any apartment or house and easy to remove if you want to change things up. Moreover, they are more cost-effective both in terms of fueling, building, and maintaining. There are four styles you can go for. The first thing you want to do when you’re buying an electric fire heater is to consider what type would work best in your environment. As implied from the name, this model inserts itself in a traditional fireplace. You install it in the existing opening, but plug into an electric outlet. You, however, don’t need a chimney, so the cost-effectiveness of electric flame heaters still stands true. More than that, you could buy an insert cheap. For example, a freestanding electric log insert that is simply a replica of wooden logs with LED-technology and sound-effects, creates a powerful illusion of a real fire and is easy to use. You need just to plug it in and put it in the fireplace. You need an existing fireplace opening, and it’s rare in modern houses. If you are interested in space heaters that look like fireplaces of old, mantel electric fireplaces are your answer. There is an appeal of the traditional mantel appearance. If you add the fact that they are self-contained and you may plug it in anywhere you like, it’s understandable why people choose these room fireplace heaters. It’s the most genuine looking fireplace space heater of all electric fireplaces. Adds a luxurious look to the interior design. Costs vary depending on materials, sizes, etc., and could be in an upper price range. If you looking for something that will save space as well as heat you on a long, cold, evening, it’s a jackpot. The main benefit of this style is you can be more creative with placement compared to other electrical fireplaces. So there’s much to think about when you consider a wall mount fireplace for a simulated fireplace heater. You like more modern-looking décor and furniture. Price could be very high. an electric fire heater that is also a great décor element. able to choose from a variety of models and styles, so you can easily tailor it to your interior décor. You don’t need to worry about smoke and fumes. It does not matter how romantic an open flame is. Fumes and smoke could make an unpleasant effect on that enjoyable experience, especially if you have asthma or sensitive eyes. With electric fireplaces there is no real burning so there is no need for concern. Electric fireplace room heaters are easy to maintain. There’s no need to clean a chimney when there’s no chimney and no ashes from burned logs, right? 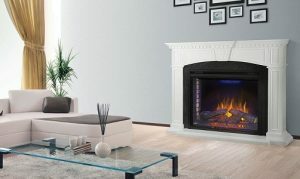 The most work you need to put into an electric fireplace is to dust it from time to time, as you do with any furniture. You’re saving money buying fireplace style heaters. Electrical fireplaces are considerably less costly than traditional fireplaces. You don’t spend money on building a fireplace. If you keep in mind an electric fireplace and heater costs only a fraction, building a real fireplace could cost thousands of dollars. You’re also cutting costs on maintenance and fuel. 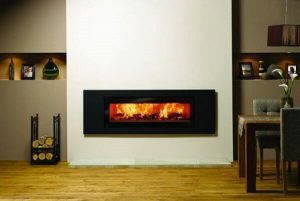 Electric fireplaces are all about energy efficiency. A fire under the mantle could burn very hot and bright, but to enjoy its warmth you usually need to be sit close to it. Electric fireplaces don’t have this problem. The warm air they generated circulates the room evenly. It is possible to turn the heat up or down so the most comfortable temperature can be chosen without going in debt over the electrical bill. There’s also supplemental heating that keeps the room warm only when needed. There’re many heating devices, but in terms of longevity, electrical fireplaces are the best. Rust or corrosion are not a threat for electrical fireplaces. You can use them for many decades to come. Anyone can install one. It doesn’t take much to install an electrical fireplace. It only needs to be plugged in and no remodeling or technical skills are required. A plethora of design choices. Home-owners can easily find an option , it doesn’t matter if they look for sleek and modern looking, or heavy, austere versions. Electrical fireplaces are the safest option for a home. There’s no need to worry about an open flame. More than that, the surface is safe to touch too because of how the heating mechanism works. Many electrical fireplaces have an automatic shut-off option to prevent accidents. You can use an electric fireplace no matter the time of the year. You can adjust the heat, making the temperature in the room comfortable. It doesn’t matter if it’s a cold winter day or a quiet summer night, an electrical fireplace helps create a relaxing and enjoyable atmosphere. They come in many different design options with many additional functions. It’s a real quest to buy the best electric fireplace tv stand if you don’t know what you’re looking for. 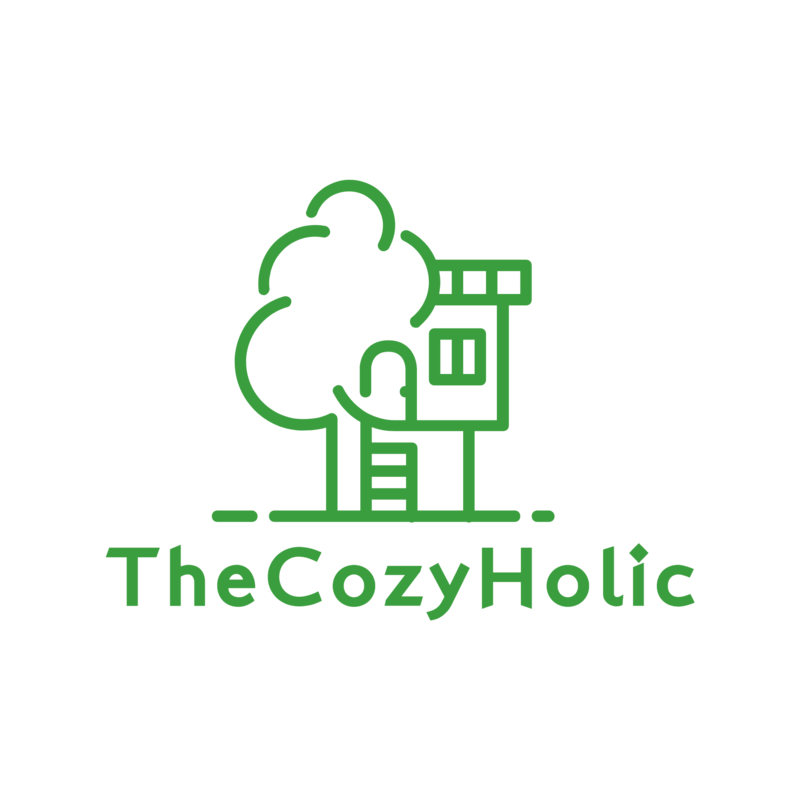 But don’t worry, because we at The Cozyholic know all about it and are happy to share the tale. To figure out the best match for your living room, you need to consider the size of a fireplace. Is your room small? Then it’s best to buy a corner unit. A corner unit is compact and fits in the corner and has an option of converting it to standard-sized unit when you free up space. Is your TV huge? You should buy a wider stand. Depending on what your room looks like, you can choose a contemporary-looking electric fireplace TV stand or a more traditional one. It you’re a fan of classical design, enhance your vision with the latter option. If you like to make statements with your decor, it would be best to use the former options. 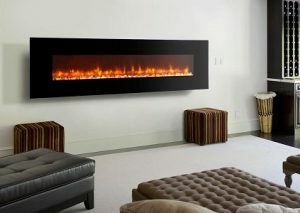 While aesthetics are important, you need to figure out what functions you want your electrical fireplace to have. Is it only decorative? Is it mainly the heating part of the artificial fireplace heater you’re going for? Read up on reviews of models that caught your eye nonetheless. Do you want a more realistic fireplace or a high-tech futuristic one? There are great options for both choices. Look at the fireplace you chose. Do you feel relaxation and ambience? If so, buy it. 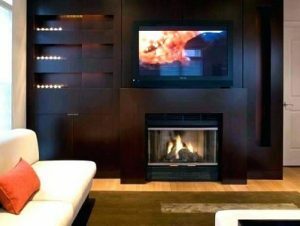 Atmosphere is all well and good, but the most prevalent thing in buying an electrical fireplace is how safe is it? You need one that doesn’t tip over. It would be best if the width of the chosen model were more than the TV size. 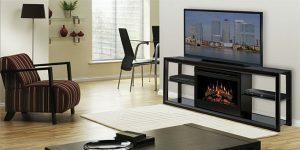 Here’re some great options that could be the best electric fireplace heater TV stand in 2019. Accommodates a TV up to 70’’ and 135 lbs. divided open shelf and 2 side cabinets with glass doors and 2 shelves allow more room for storage. great stand for a TV with up to 60’’. remote-controlled, touch panel has 4 settings. separate fire switch for summer days (you can turn it on without turning on the heat). crafted from high-grade MDF and durable laminate. 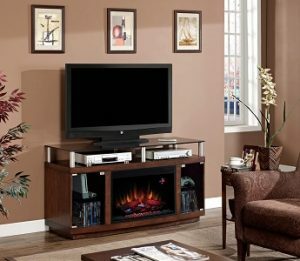 What is the best electric fireplace TV stand? 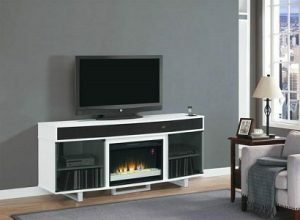 Electric fireplace TV stands come in various shapes, sizes, and color. Those options are important when you are choosing a fireplace TV stand, but are subject to individual preference. What you choose depends on the size of your TV, available floor space, and your personal design preferences. You can freely compare tge functionality of fake fireplaces. Here, the R.W.FLAME would win hands down, if not for one small caveat. It’s better used as wall mounted, built-in or table top device. 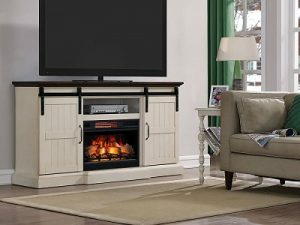 For a TV stand, the best fireplace heater is the Ameriwood Home Farmington Electric Fireplace TV console. It has a remote control and touch panel. You can adjust power, flame, heat, and set a timer. The last feature not only allows you a more comfortable user experience but also additional safety.